Webb & Co. to Shake the Walls at Exit/In - Saturday, November 14th, 2015! Event poster - click for larger version! The Stars are aligning for Webb Fest Ten this year, to be held at the world-famous Exit/In, located in Nashville! 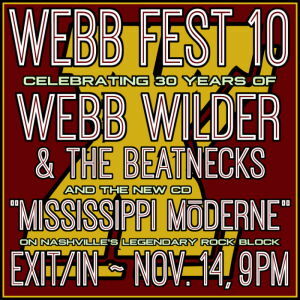 Webb and the Beatnecks' 30th year as a band! The tenth year for Webb Fest! An album release year for "Mississippi Moderne," which is getting great reviews! The band played Exit/In early in their career, as have many other famous bands. 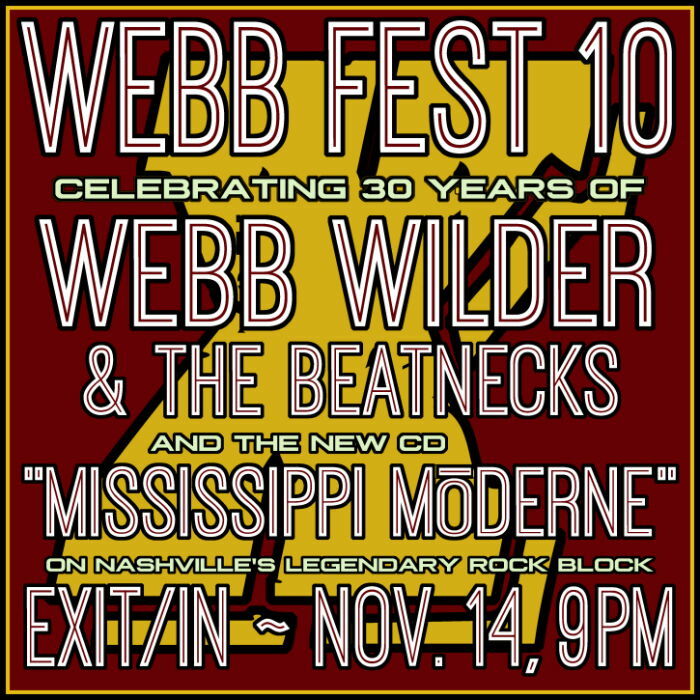 Webb Fest Ten will be a triumpant return for our fearless leader and bandmates, for the very first Webb Fest to take place in his hometown of Nashville, Tennessee! Tickets are $10.00 each. Attendance is 18+ years of age, per Exit/In's website. The doors will open at 7pm, and the show starts at 9pm. There will be the usual festivities, door prizes, and other shenanigans going on, and maybe even a short video if the venue is equipped to do so. Don't miss out on the Last of the Full Grown Men in this epic, Fall Classic of all 'Fests, and a Tater Bodine Production! Doors open at 7pm for socializing and activities. Webb and the Beatnecks play at 9pm. While not officially an event sponsor, Extended Stay America in Brentwood has reasonable rates and will give another 15% off their listed rates if you sign up for their free rewards program. Please note that "Advanced Purchase" rates listed on their site do not receive this discount, and are nonrefundable. Travel time from this motel to Exit/In is 20 to 30 minutes, depending on the route taken. Here is a link showing point-to-point directions.